It’s time! You have read a bunch, you’ve ordered your hive and maybe you’ve pre-ordered your bees. It’s time to start your beekeeping journey. The following walks you through a typical process for how a hive is assembled and installed. It should be noted that there are many variations in how you might install your hive – the type of hive, assembled or in kit form and so on – that we take a general approach that can be adopted. We will use the most common type of beehive, the Langstroth, but the principles here are largely relevant to the Warre and Top Bar too. It’s finally real and a real hive needs a real place to go. There are a few things to take into consideration when you’re picking out a location for a hive, though none are too demanding. Never forget what bees need, but here’s a quick recap. Bees need to eat. As you know, honey bees will travel miles looking for nectar and pollen, so if you don’t have flowers in your garden there’s no reason to despair. If you can make it easier on them, though, you should. Placing your hive right next to a garden, a field of flowers or an orchard will cut down seriously on your bee’s need to fly all over and will speed up their production. Pay attention, too, to the idea of the honey flow. A little planning here can go a long way. Bees also need water, to drink and for other reasons. They use water to cool the hive, to dissolve crystallized honey and to feed larvae. It is essential to the function of the colony and unlike other resources the bees don’t really store it up in the hive. Instead they make water runs, which means they need a constant source of water nearby. 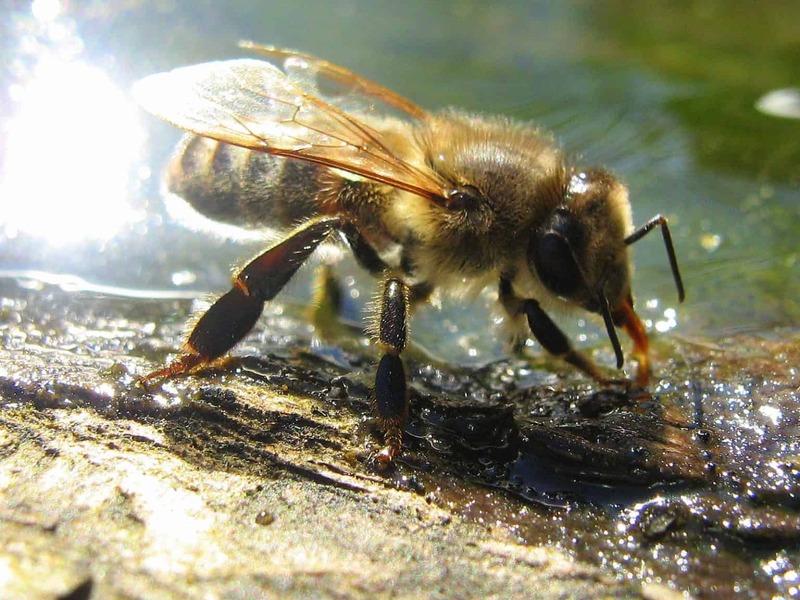 If you have a source of water on your property, like a stream or a pond, try to place your hive close by. Of course, land with a ready supply of natural water is not a luxury available to all of us. If you live in a residential area, the most convenient water source might be your neighbor’s swimming pool or leaky hose, which doesn’t breed particularly good neighborly relations! Do something about that. If you don’t have a natural water source for your bees, put out a dish or bucket of water by the hive and make sure there’s water in it. It’s alright if you don’t change the water often and bees actually prefer a little slime on top. Make sure it’s not just a pool of water. Bees have a tendency to drown, so try to place rocks in the water so they have easy places to land and collect water. Many bee feeders factor this into their design. Bees spend a lot of time and energy regulating the temperature inside the hive. The least you can do is help them out. Orient your hive so it faces south or southeast (if you live in the Southern Hemisphere, do the opposite). If you can, put it in a place that’s shaded by deciduous trees. This way it will receive some, but not too much, sun in the summer when heat is the enemy and full sun in the winter when heat is desperately needed. Bees don’t like having obstacles too close to the front of their hive (and, as a reminder, when inspecting your hive try not to walk in front of the hive). It can affect their ability to find their way back and can sometimes be enough to make them up and leave. That is rare, though, and generally only a problem if the obstacle is right in front of the entrance. There is one qualifier where an obstacle in the front might be justified. In some situations, you need your bees to get “up and away”. This can be advantageous, for example, when close to places that humans might inhabit. A tall obstacle can ensure the bees gain altitude soon after leaving the hive. Once they reach “cruising height” they tend to stay there, so this tactic can help keeping bees away from humans. That said, there is normally a place to locate the hive that doesn’t require such diversionary tactics. One place where you should consider obstacles is directly behind your hive. Beehives can get tall and unwieldy, and have been known to blow over in strong winds. Place your hive in front of a windbreak, like a hill, some bushes or a fence. What else makes bees happy? A nice level spot, free from damp. Don’t put your hive in a low spot where water might pool or on uneven ground. A hive stand is valuable here. Remember that you’ll need to get to your hive. Carrying lots of equipment is no fun. And in your second year, you might have to carry many pounds of honey! Don’t place your hive somewhere way out of the way that’s a pain to reach, especially in the snow. By the same token, though, try to keep it away from high traffic areas. If people or pets are constantly moving near your hive, it’ll stress out the bees and probably result in a few stings. Beehives can come assembled or, for a little less money, unassembled. For illustrative purposes, this section is all about putting together an unassembled hive. If yours is already in one piece, skip on down to the next section. You are probably marveling at just how many pieces you have on your hands! It can be a little daunting. But don’t worry, the whole process is intuitive and simple. Once you’ve put together one portion, you’ll have a decent idea how to do the others. Before you dive in, you’ll probably want to gather a few important tools. Your kit should have come with the appropriate nails. Generally, it’s not necessary to both glue and nail your pieces together, but remember that between the thousands of bees and the dozens of pounds of honey, they’re going to have to hold up quite a lot of weight. It’s best to make them as structurally sound as possible. It is helpful, though not essential, to have some long clamps for holding the boxes in place as you nail them together, as well as a carpenter’s square to make sure your corners are ninety degrees. These tools help ensure that your hive ends up square. You can make do without them, but they’re both highly recommended. Regardless, it is essential that your corners all match up in the end. Now it’s time to start assembling. Your kit should have come with, at minimum, a bottom board, one or more boxes, enough frames to fill them and inner and outer covers. Let’s start with the boxes. These are often called supers. With no top or bottom, they are simply four sides of wood that have to be fitted together. Easy. With the Langstroth the boxes are not square. Therefore, there are two short sides and two long sides and each of these has two opposite serrated joints that interlock to hold the sides together. On the outside of two of the sides there should be an indented groove, which will function as a handle when the whole thing is assembled. Make sure, when you put it all together, that these are facing out and the flat part of the groove is on the upper side of the groove. It won’t be much good as a handle, otherwise – and it’s really easy to nail everything together and THEN realize the handles are in the inside or the groove faces down! Once you check the handle is aligned “out and up”, dab a little wood glue on the recessed part of each box joint and fit the four sides together. Use your carpenter’s square to get your corners at 90 degrees and your clamps to hold them that way. Before the glue hardens, nail your pieces together. Chances are good that your kit has come with nails and pre-drilled holes in the box joints. Every time you turn the box, double check with a carpenter’s square and rearrange your clamps, if need be. By now your box should be pretty sturdy and you can remove the clamps. Continue driving in nails two at a time, followed by the two opposite, until there’s a nail in every nub. Of course, if you want to avoid all of this, just order pre-assembled boxes! Now you have a box! Repeat this process for however may boxes you have. Frames come in quite a few varieties, depending upon what kind of foundation you’re using (if at all). At its most basic, though, a frame is very similar to a box. It’s made of four sides that need to be glued and nailed together so that its corners are square. Your frame will have unique top and bottom bars and two identical sides. Again, pay close attention to this with each frame. The top will be the longest piece, with a wide, flat area on either end to support the frame inside the box. Both the top and bottom bars have notches near the ends that fit into the forked ends of the sides. Put a dab of glue on the inside of each of these forks and fit the pieces together to form a rectangle. This is your frame! Check your corners with your carpenter’s square and nudge the frame into shape if need be. Before the glue dries, hammer two nails into each end of the bottom bar, attaching it to the sides. Flip it over and do the same with the top bar. Really, this is enough, but if you want to add some extra support, hammer a nail into each side, at an upwards angle, to attach it to the top bar. Given that this can be a somewhat repetitive task, many beekeepers purchase a Frame Assembly Jig to move things along a little quicker. Here is something else to consider. Let’s say you have two boxes and are using a 10 frame Langstroth. You have 10 frames in each box. With two boxes that’s 20 frames. Now think of each frame and 4 nails. 20 x 4 = 80 nails to hammer in. This might be a good time to suggest assembled frames have their advantages! Now you have a basic frame. What comes next depends upon the type of foundation you’ve bought. If you’re going foundationless, then congratulations – you’re done! If you are using plastic, then you can should be able to simply snap it into place in the grooves in the top and bottom bar, fitting the foundation within the inner dimensions of the frame. If you’re using beeswax foundation, it gets a little trickier. Most beeswax foundation is sold with crimped wire for support. If the wire ends flush with the wax, then it can be pushed into place in the top and bottom bar grooves, much like the plastic foundation. Sometimes, however, this wire extends about a centimeter beyond the wax on one side and bends at a 90-degree angle. This is hook wire foundation. It gives the foundation a little more support, and it requires a special kind of frame with a removable wedge on the top bar. The wedge is a long strip of wood lightly attached to the inside of the top bar. You should be able to pry it away easily with your fingers or the back end of your hammer. The bottom bar should have a groove running down its inside. Fit the hookless side of your foundation into this groove. The hooked side should be flush with the top bar, with the hooks laying against it. Put the wedge back in place so it lays over the hooks, and nail it into place with two short nails. This style of foundation is often also sold with support pins. These are little metal pins looking liked forked nails that can be pushed into the sides of the frame to further hold the foundation in place. After you’ve installed the foundation, look for small holes drilled into the sides of the frame. Gently push your pins through the holes (you should be able to do this without the hammer) so that the two prongs go around the wax. If you squish the wax a little bit, it’s okay. It doesn’t have to be perfect, and the bees will cover it up soon enough! There’s one more option with wax foundation, and that’s to install the wire by hand and embed the wax foundation in it by melting it electrically. This is pretty involved requires extra equipment, and isn’t likely to be found in a beginner’s kit. There are indeed various options for foundation and he’s a neat video that describes some common options. This is a time when it’s handy to buy frames pre-built and leave it to someone else to make sure it fits! But that is your choice. The bottom board is the floor of your hive. There are two styles: solid and screened. The solid bottom board is very simple. If the board comes in several pieces, glue them together end to end. Next, attach the cleats. These are, basically, the front and back rails, one thick and one thin. The thick one slots onto one of the open edges of the board. and the thin one under the board, flush with the remaining open edge. It functions as a foot, keeping the top of one side of the bottom board open for the bees to use as an entrance. The screened style is very much the same, but with a screen instead of a solid board. It’s very popular for assessing varroa mites. Assembly should be the same, except instead of a board, you’ll put together a thin, open frame and staple a metal screen across it. The inner cover fits over the top box. It should be made of four grooved sides and a sheet of wood or masonite with an oval cut into its middle. There is typically a hole in the center over which a feeder can be placed. Glue three of the sides together, and slide the flat sheet into their grooves. The final side is probably in two pieces that don’t quite add up to the length they need to fill. This is how it’s supposed to be. Attach them so they’re flush with the other sides and a little space is left in the middle – this will be the upper entrance to the hive. Your top cover (sometimes called an outer cover) may be all wood or it may be metal. If it’s wood, it goes together a lot like the bottom board. Glue the sections together, then fit, glue, and nail the side rails on. Metal covers are especially popular is cold climates, where the bees need to be protected from the winter elements. You should have four sides to a frame that can be glued and nailed together. On top of this goes a thin piece of wood, followed by a sheet of metal. Turn the edges of the metal down and nail them into the frame. Some top covers provide additional features like the ability to manage condensation using a “wicking “material, which can be an important consider in the winter. Once your pieces are assembled, it’s time to paint, assuming you have a pine beehive. Pine needs more attention than cedar, which is a tougher more resilient wood and considered more of a premium choice. The traditional color is white, although any color will do. If not white, you should opt for a light color help keep the hive cool in the summer. Of course, if you live in an especially cold climate, a darker color may be a good choice for keeping the colony warm. You should never paint the inside of the hive. Paint prevents the wood from absorbing moisture, which is essential to keeping the hive dry and cool. It also leaves a strong smell of paint that the bees probably won’t like and may even be toxic. Bees like their home to smell like bees, not chemicals, and an overwhelming scent of paint may drive them away. The reason you paint the outside of the hive is to prevent weathering. With the cost of hives it makes sense to do what you can to help yours stand up to the elements. So how do you know what to paint? The basic rule of thumb, at least for pine hives, is that if it’s going to be rained on, paint it! This equates to the outsides and edges of the boxes, the bottom board and any outer wooden parts of the outer cover. This is why it makes so much sense to construct your hive first. It saves a lot of guessing and over-thinking which sides are going to face outwards. It’s true that some of the bottom board will face inside the hive, but it’s much more open to the elements than the other pieces and needs a little extra protection. When you’re picking out paint, choose a good latex variety that can be used outdoors. For the best coverage, apply a layer of outdoor grade primer, then two layers of paint. You’re not covering too much area, so any outdoor paint you have leftover from another project, or a single can of mistake paint from a hardware store ought to get the job done and save you some money. After you’re done painting, let your hive air out for several days. Even though you haven’t painted the inside, the smell of fresh paint can be overwhelming for the bees. Even if you haven’t painted at all, you should still air out your hive. New wood and glue can be a strong enough smell to put the bees off. You’ll want your hive to spend several days outdoors to achieve as neutral a smell as possible. This is why it’s a good idea to get your equipment well in advance of your bee’s arrival. By the way, avoiding the need to paint is why many beekeepers prefer cedar, among other reasons. For cedar beehives a coat of tung oil is strongly recommended, though not essential. Aside from improving the longevity of the wood, it lends a deep, beautiful color and many also love the smell! If you’ve ordered your hive pre-assembled, you get to skip all that construction. If you ordered it pre-painted, too, you’ve saved yourself some work. You should still air it out for a few days, though. Anything new is going to have a fresh-from-the-factory smell that the bees won’t necessarily appreciate. Once all your parts are together and painted and aired, it’s time to stack them up. 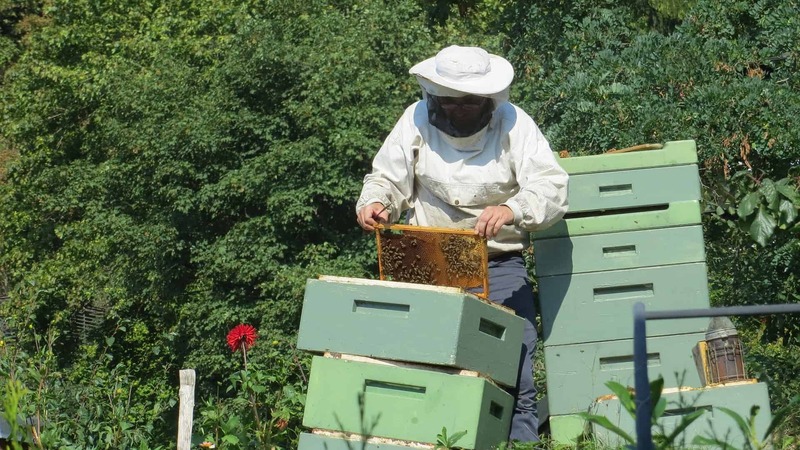 Langstroth hives are like totem poles – one piece goes on top of the other to make a tower that can get pretty tall at the height of honey production. Each piece plays a specific part, and they have to be stacked in the right order to work. The very first thing you need is something for your hive to sit on – if the bottom board rests on the ground it leaves the hive wide open to damp and critters. Some kits come with a hive stand, acting as a base. If your kit came with one, use it. If it didn’t, don’t despair. A hive can sit on anything as long as it’s level. Two cinder blocks with a piece of wood laid across them works perfectly. On top of your stand goes the bottom board. One side should have four pieces of wood, or cleats, running around the outside. The other should have three. Place it so the one with three is facing up, and the open end is pointing in the direction you want to be forward. This is your bee’s entrance. Check the balance of your stack so far making sure it doesn’t tip or rock. If it does, now is the time to adjust, not when it’s full of lots of honey and angry bees. Next comes your boxes, which will form your hive’s body. If you have multiple boxes of different depths put the biggest one down first. This is called a deep (or deep super). Make sure the grooves on the outside have the flat side pointing down, so they can be used as handles. Line the back corners up with the bottom board – the front of the bottom board should stick out a few inches. This is the landing board and the bee’s front porch where they’ll take off and land. Fill up your boxes with frames. The top bars of the frames stick out a little on each side, which lets you rest them on the rails just below the rim of the inside of the super. This lets the frames hang down the inside the box. 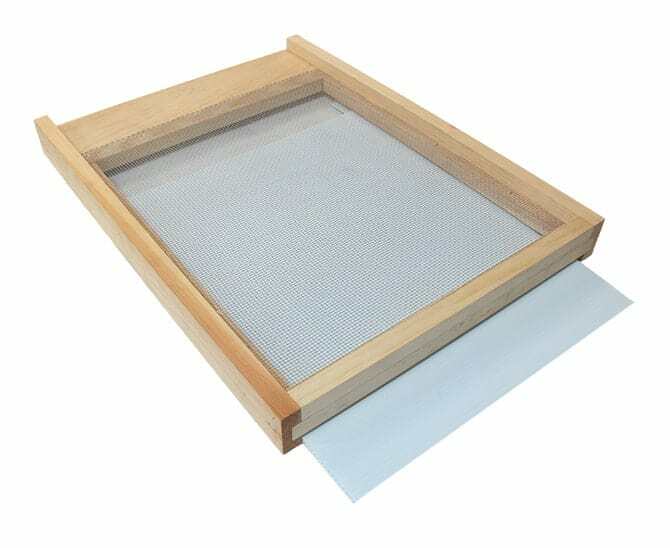 Fill up the box with frames – it should hold either eight or ten. Do NOT leave an empty space in your boxes. Your kit might include just the one box. If that’s the case, skip down to the inner cover. If you have another deep box, put it on top of the first and fill it with frames. This will be your second hive body. If you have a smaller box, this will be used for honey. You don’t need to add it now, since your bees will lay eggs and build comb first before they start making honey. You can put it on now if you want to, though. Before you add your honey super, see if you have a queen excluder. Not all beekeepers use them and many are really against them. It’s a thin metal grating that you lay between your hive body and your honey super. The grating is just the right size that workers can get through it but queens can’t. This means the queen can’t get up to the honey super to lay eggs, and you can know that your honey super will contain only honey. It’s all a matter of preference at this point whether your kit came with one or not. If it did, put it on top of your highest deep super. PerfectBee doesn’t recommend the use of a queen excluder in the first year. Just let your bees do their thing naturally and be concerned honey production from the second year. On top of your queen excluder (or your highest box) goes your honey box. This is probably smaller than the deep boxes you used for the hive body. Fill it with the frames that fit, just as you did for the hive body. No matter how many boxes you use, you need an inner cover. Place it on top your highest box with the corners lined up. One end of the cover may have a notch in its border. This is the upper entrance to the hive. Position the cover so the notch is facing down and forward. This allows for ventilation and another way for the bees to leave the hive. In the winter, you can turn the inner cover upside down, closing off the entrance and helping the bees to keep warm. Last but not least is the top cover. Lots of top covers are telescoping, meaning they’re larger than the hive and their edges fit down over the sides, like a the largest section of a collapsible telescope. Set the top cover over your inner cover. There should be some wiggle room from front to back. Push it so the back of the outer cover is up against the inner cover – this will leave some space in the front so the bees can use the upper entrance if one exists. 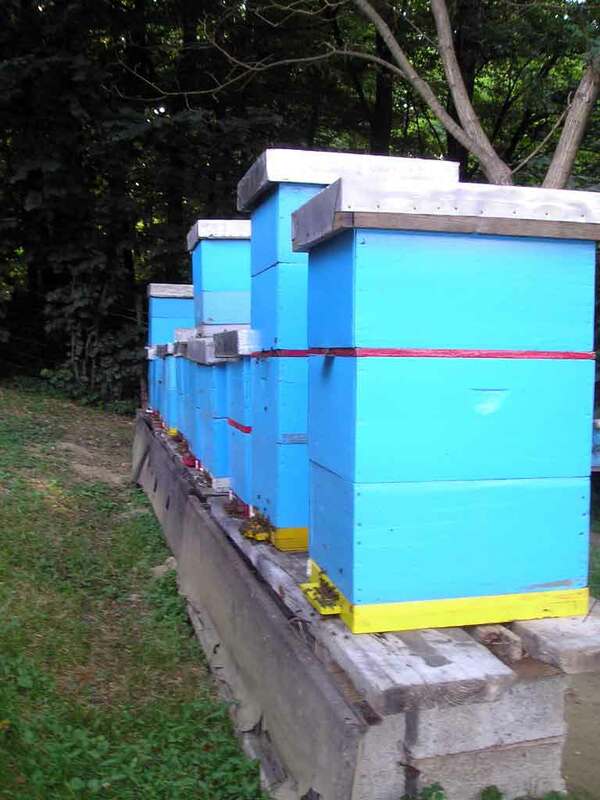 Here’s a photo of assembled Langstroth hives with the parts color coded. The bottom board is yellow. The queen excluder is purple. The telescoping outer cover is metal. This beekeeper has decided, at least for the closest hive, to use the same size of boxes for both the hive bodies (the two below the queen excluder) and the honey box (the one above the queen excluder). I built Langstrath hives and all frames from White Pine trees that I felled and milled myself. Is there a benefit to a slatted bottom, vs a plain bottom? I have a screen bottom so I will assume that allows for ventilation when I am not checking for mites? Thanks!